Dogs, like humans, were designed to be on the move. In the wild, a dog had to be on the move to stay out of trouble (e.g. avoid becoming a Velociraptor’s meal). Similarly, when a dog was hungry, the tastiest meal could only be got by hunting it down! All that has changed in today’s world. Now, your dog is served her food in a beautifully decorated bowl. And, she does not have to worry about predators getting to her while she lounges in the living room. Trouble is, her body has not yet evolved to take advantage of the new scheme of things. In fact, her body continues to do best when she remains on the move. That is why dog exercise is important. Here are some of the top reasons why you should make sure that your dog is exercised regularly. 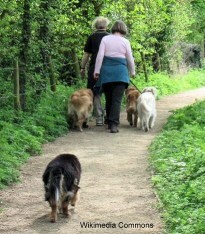 A regularly exercised dog comes to depend on the enjoyment derived from exercise. As the appointed time nears, she will get restless with excitement. Some dogs will even drag out your running shoes and fetch the leash. In short, they love it! Dog exercise can burn off calories at up to ten times the sedentary rate. This tones her muscles and invigorates all the organ systems in her body, helping them to remain well-conditioned. Additionally, your dog has a far better chance of maintaining an appropriate body weight if exercise is a regular part of her routine. Dogs may have the edge over cats because, unlike cats, owners usually have to be explicitly involved in exercising their dogs. This involvement often means that owners benefit from a reasonable workout as well. It’s early in the morning, the sun is on the cusp of rising, and the weather is cool and crisp — and there’s only you, your dog and the walking trail. It is moments like these that strengthen the bond between you and your dog. A strong bond helps keep your dog calm, alert, happy, and interested in life. If your pet has packed in a few extra pounds over the years, dog exercise is a wonderful way to help her get it off. Not only does exercise consume calories, but the increased activity help reduce the stress that her reduced diet places on her organ systems. Dogs that belong to “working” breeds like the Akita, or Boxer, in particular, derive enormous mental benefits from regular exercise. Such dogs may require tailored exercise regimens, but the extra effort will be well worth it. Without exercise, these dogs can develop all kinds of neuroses. Click here to learn how exercise can help with behavioral problems. Moderate exercise provides a workout not only for the body but for the mind as well. A pleasantly tired dog who has received the mental stimulation she needs will have a healthier, more restful sleep — beneficial to overall health. Obsessive compulsive disorders (OCD) have a powerful mental component. Exercise’s mental stimulation and physical benefits counter OCD tendencies. A healthy digestive system is critical to good health. Exercise is known to have positive effects on the digestive system. Your pet may often choose this time to evacuate her bowels; in addition, moderate exercise will improve her appetite; this is particularly useful if she is a finicky eater. The skeletal systems of dogs (and humans) — that is, bones! — are living tissue. Old bone cells are removed and new, healthier cells are added in a never-ending process. This remodeling process responds to exercise; your pet’s bones and joints will become more robust, making her less prone to arthritis and other bone disorders. A word of caution : young growing puppies, especially of large breeds (e.g. Irish Wolfhound), should not be allowed to get too rambunctious. If your pet is experiencing symptoms of arthritis like joint pain, reduced mobility, then a supplement like Pet Bounce might help. The benefits of exercise are manifold. Not only is your pet benefited physically, but mentally as well. Ensure that your pet gets exercise appropriate to her age and breed and she will live a happier and longer life. As a bonus, you will be happy to learn that studies show owners who regularly exercise their dogs tend to be fitter than people without pets! Previous post: How To Fatten Up Your Dog The Healthy Way?